Sales, Coupons, Events, Specials, Insider Info. PDC Spa & Pool World has everything you need to make every day a relaxing vacation in the privacy of your own home. Hot Tubs, Saunas, Above Ground Pools, Pergolas, Privacy Screens, Arbors, Trellises, Parts, Supplies, Service, Patio Furniture, Accessories And The Areas Finest Showroom! A Must See Showroom! The Largest In The Area! Our Lehigh Valley Pocono Area Showroom has a great selection of PDC Hot Tub Spa models on display as well as Saunas, Above Ground Pools, Outdoor Furniture, Pergolas, Privacy Screens, Arbors, Trellises and a large selection of chemicals, toys and accessories for saunas, spas and pools. PDC is where you will find one of the largest and most unique showrooms in the area. Located at 701 Bridge St. in Lehighton, Pennsylvania and less than an hour from almost anywhere in Eastern, Pa. We have been in the business of providing specialized services for our customers for over 30 years. PDC SPAS HOT TUBS & SWIM SPAS - Hot Tubs Spas - Swim Spas - Whirlpool Tubs - PDC Spas Official Dealer - PDC Spa & Pool World invites you to slip into the warm soothing waters of a quality PDC hot tub and let the tensions and stress of your daily life melt away. Serving Lehigh Valley, Poconos, PA. Surrounding Region. Made In The USA For Over 60 Years! TRUSTED QUALITY! Premium Hot Tub Spa Series The Premium Series represents the most affordable way to experience the wide-ranging benefits of owning a PDC hot tub. Five powerful yet surprisingly economical hot tub options provide ample seating for 4 to 7 guests, including models with captain's chairs, loungers and ultra-comfortable bucket seats. Ideal for homes and patios of all sizes, the Premium Series is a customer favorite! Luxury Hot Tub Spa Series For those seeking the highest level of quality, comfort and design, PDC Spas Luxury Series offers five exquisitely-crafted luxury hot tubs; with seating designs ranging from 5 to 7 users. The Luxury Series also includes over a dozen premium upgrades and performance features, as well as our industry-leading 35 year structural warranty, to help you get the most from your hot tub experience. Life Style Hot Tub Spa Series Our Life Style Series of performance hot tubs unites the luxury features of a premium hot tub, with the affordability and versatility that the PDC Spas line is known for. We offer five innovative models to choose from; each one specifically engineered to provide unsurpassed comfort, style and hydrotherapy performance. Choose from seating arrangements that range from 3 to 7 guests. PDC Swim Spas PDC Swim Spas are where innovation and fitness meet! Simply step out your door into a private backyard oasis of warm water action for the quickest, most beneficial exercise experience on your time schedule. Swim Spas For The Lehigh Valley, Poconos and Eastern Pennsylvania. Swim Spas Synergy Series Whether you are an athlete in training, a fitness enthusiast, wanting relief from joint pain, or looking for hydrotherapy and a better way of life, adding a PDC Swim Spa to your lifestyle is the answer for you. Swim Spas Tru Swim Series PDC Swim Spas are where innovation and fitness meet! Simply step out your door into a private backyard oasis of warm water action for the quickest, most beneficial exercise experience that meets your personal time schedule. Swim Spas Vitality Jet Fitness™ Newly released fitness series spas in four distinct models offer all the benefits of aquatic exercise for those with their waistline and wallet in mind. Three powerful Synergy Pro™ Jets offer adjustable resistance to walk, jog, run, lift weights Or, choose to simply relax in the warm swirling waters with family and friends, enjoying your backyard year round. Infra Saunas:: 2-in-1 Sauna Combination Steam & Far Infrared! 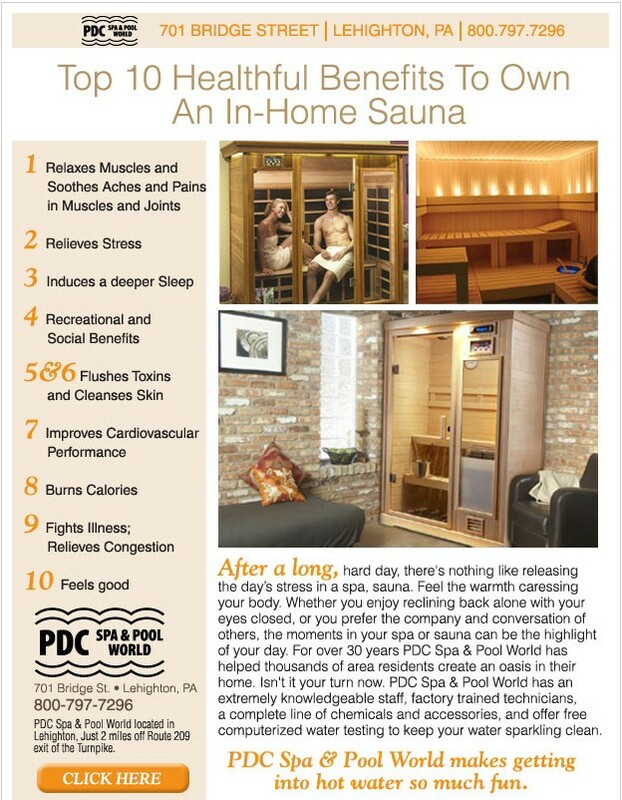 Saunas: 2 In 1 Saunas - Infrared Saunas - Far Infrared Saunas - Infra Saunas - Steam Saunas - Sauna Kits - Sauna Showroom - Serving Lehigh Valley Poconos Northeast PA. I wanted to take a minute to let all of you know how pleased my wife & I were with the crew you sent to install our pool. They were prompt and very professional. They both took time to explain the use of the filtration system and answer any questions we had. 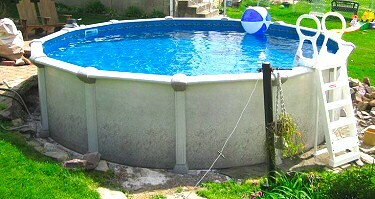 They also asked for our input on where to install the pool, the filter & the pump. Over all we are very pleased with our experience with PDC Spa & Pool World. 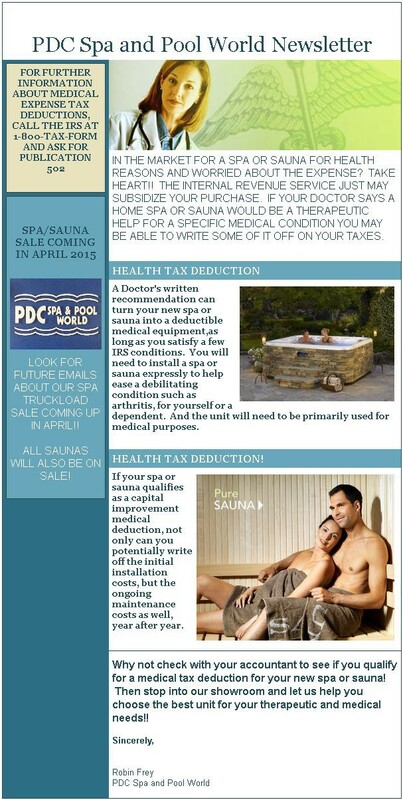 Hot Tub Sales Sauna Sales Floor Model Sales, Truck Load Sales, We Have Many Sales Throughout The Year. Sign Up For Our Email List To Be Notified Of Sales, Discounts And More! PDC Spa & Pool World Official Dealer Of PDC Spas, Hot Tubs, Saunas, Above Ground Pools, Fiberglass Pergolas, Privacy Screens, Arbors, Trellises, Parts, Supplies and More! All on display in our Lehigh Valley, Pocono Area, Spa, Hot Tub, Sauna And Above Ground Pool Showroom as well as knowledgeable and friendly staff that are ready to assist you and answer your questions. We Offer Hot Tubs, Whirlpool Tubs, Jacuzzi Tubs, Swim Spas, Swimming Spas, Saunas, Steam Saunas, Infrared Saunas, Spa Pergolas, Privacy Screens, Arbors, Trellises, Spa Enclosures, Above Ground Pools, Spa Parts, Pool Parts, Pool Supplies, Sauna Supplies, Spa Supplies, Saratoga Spa Parts, Service, Finnleo Saunas, Spa Repair, Pool Chemicals, Sauna Chemicals, And More! Serving: Brodheadsville, Tannersville, Poconos, Hazleton, Lehigh Valley, Allentown, Bethlehem, Easton, Pennsylvania, PA, Fogelsville, Nazareth, Wilkes Barre, Laurys Station, Center Valley, Reading, Pocono Manor, Pocono Summit, Pocono Region, Saylorsburg, Shawnee, Scranton, Monroe County, Pike County, Carbon County, Luzerne County, Lehigh County, Eastern Pennsylvania.